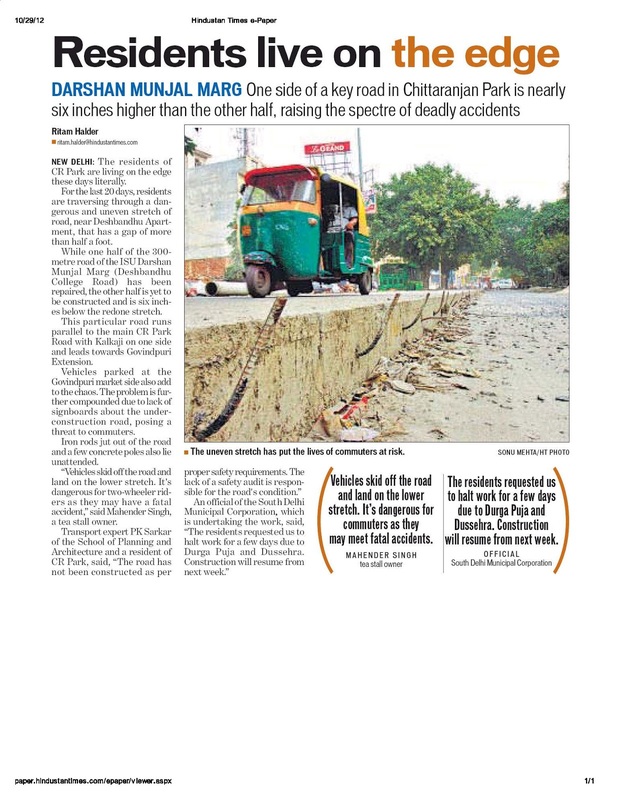 For the last 20 days, residents are traversing through a dangerous and uneven stretch of road, near Deshbandhu Apartment, that has a gap of more than half a foot. While one half of the 300metre road of the ISU Darshan Munjal Marg (Deshbandhu College Road) has been repaired, the other half is yet to be constructed and is six inches below the redone stretch. This particular road runs parallel to the main CR Park Road with Kalkaji on one side and leads towards Govindpuri Extension. Vehicles parked at the Govindpuri market side also add to the chaos. The problem is further compounded due to lack of signboards about the underconstruction road, posing a threat to commuters. Iron rods jut out of the road and a few concrete poles also lie unattended. “Vehicles skid off the road and land on the lower stretch. It's dangerous for two-wheeler riders as they may have a fatal accident,” said Mahender Singh, a tea stall owner. NEW DELHI: A recent Delhi high court order has spelt major relief for hundreds of water bodies in the capital that are being fed with untreated sewage. The court has directed Delhi Jal Board and Delhi Pollution Control Committee to ensure that unless sewage is treated to levels prescribed by the Central Pollution Control Board, it cannot be discharged into lakes, ponds or other water bodies. Even as several lakes are fed by treated or untreated sewage — including Hauz Khas lake, Bhalswa lake and Sanjay jheel — DJB officials claimed that "to avoid pollution of ground water and harm to plants, animals and aqua life, it is not advisable to recharge ground water or water bodies with treated sewage because of the standards maintained of (at) the sewage treatment plants (STPs)". "Biochemical Oxygen Demand or BoD levels in treated sewage should not be more than 30mg/lt. This is the level maintained at all STPs and most of them are treating this level too. However, against a demand of 680 million gallons per day, Delhi has sewage treatment capacity of 513.4 million gallons per day. It is treating even less as all sewage does not reach the STPs. A lot of this feeds small lakes and ponds. DJB's logic is that in flowing water systems like rivers, natural processes lead to an improvement of water quality. These systems are missing in still water systems," said a source. The order, issued by Justice Rajiv Sahai Endlaw, has directed DPCC to monitor from time to time all STPs to ensure their proper functioning, and that any deficiency should be reported to DJB immediately. 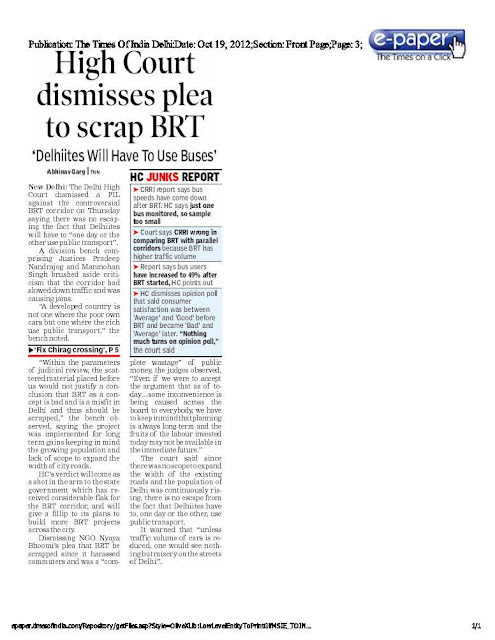 DJB has also been directed to act immediately if DPCC complains about the working of any STP. Both DPCC and DJB have been asked to ensure that treated sewage from STPs "is not discharged into water bodies like lakes, ponds etc, unless the same is compliant with prescribed standards". The water quality in Hauz Khas has recently shown an improvement after DDA put up a check dam in Sanjay Van at the point where untreated sewage was getting mixed with Vasant Kunj's treated effluent and was entering the lake. However, the measure is only temporary and the lake could be at risk if the procedure is discontinued. Bhalswa and Sanjay lakes are other examples of water bodies where untreated sewage finds its way into. While some may dry up if untreated sewage is stopped from flowing into them, sources say that sewage needs to be treated and not stopped from entering water bodies. New Delhi: Think of the drain behind your house, the eyesore of the colony which is usually lined with garbage, stray cattle and dogs, and stinks so much that one would not venture near it. Now imagine a tree- lined canal, an open public space that has people walking and cycling along the gently gushing water. 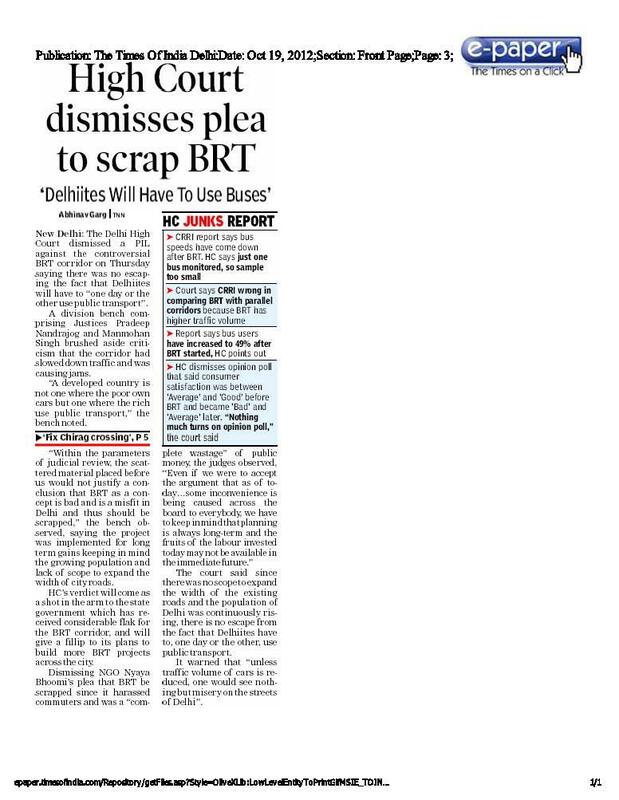 The idea may sound ambitious but the Delhi government has plans to convert several of the city’s larger drains into eco-corridors: areas that will be used extensively as non-motorized stretches and connect colonies to the BRT corridor, Metro stations and bus stops. The non-motorized transportation (NMT) eco-corridor project will be incorporated into DDA’s master plan and has been prepared by UTTIPEC. The project has two components — developing areas along drains as recreational public spaces and developing a road network that includes special corridors for cycling and walking. 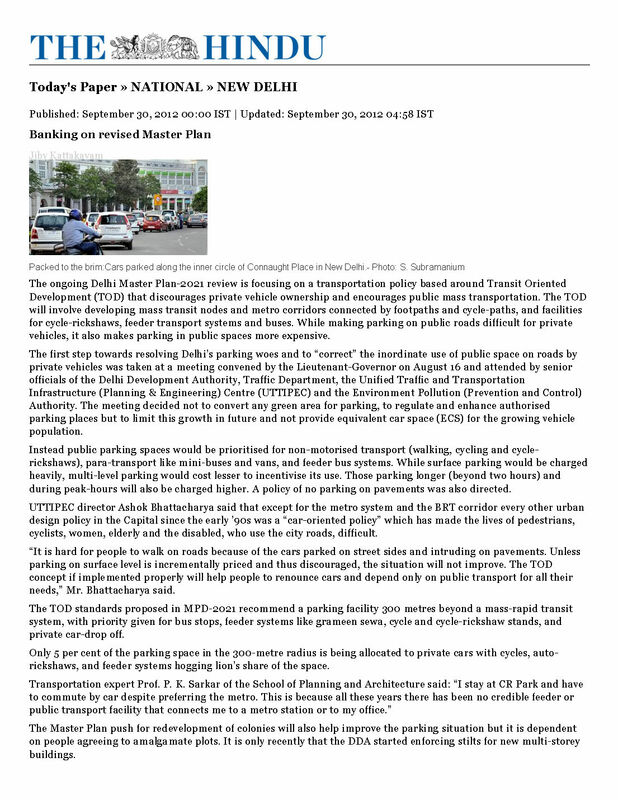 “We have to shift focus from traffic planning to mobility planning. However, the development of recreational areas is entirely dependent on the cleaning of the drains. The project has been around for ages but if it has to work the government needs to take a holistic view of it and carry out all works together,” said an official. The project aims to tackle open drains and bring down traffic congestion, which is the prime reason for Delhi’s rising pollution problems. “Among the proposals we have already mulled are connecting Nizamuddin Railway Station and ISBT to Jungpura Metro Station. The existing open drain behind Nizamuddin that passes by Jungpura is an ideal location to develop NMT. The other stretch is from Sheikh Sarai to Moolchand Metro station. This will also provide connectivity from the Saket malls to GK-I. 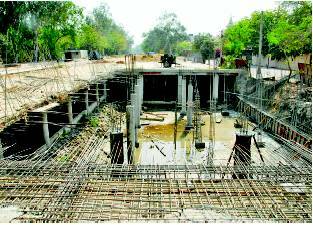 The project along the Barapullah drain is the most extensive and will provide an interface with existing modes of public transport,” said UTTIPEC director Ashok Bhattacharjee. 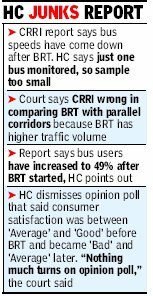 “We have a cycle sharing system along the BRT corridor but one reason it failed was the insufficient number of stations to park. Development of sufficient infrastructure is a priority. A sizeable number of cycle parking points, convenient hiring systems, accessible locations and dedicated paths even along the main roads need to be put in place. 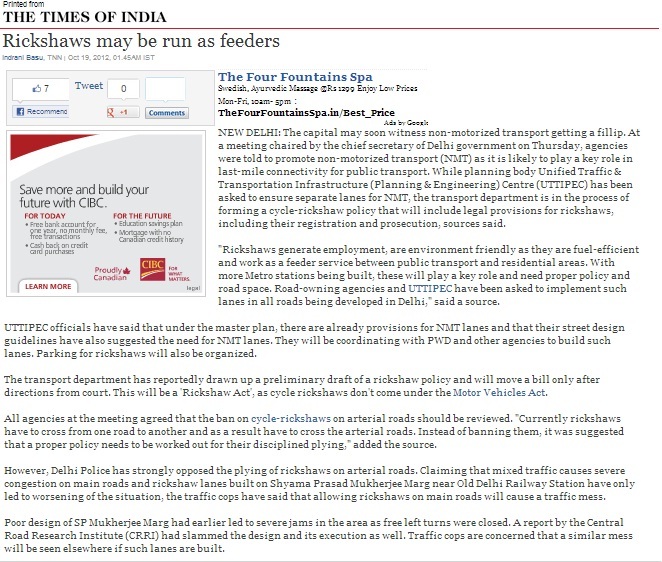 The cycle tracks need to become transit routes, between colonies, within colonies and between colonies and public transport points,” said a source. The environment department, too, has been promoting the project. 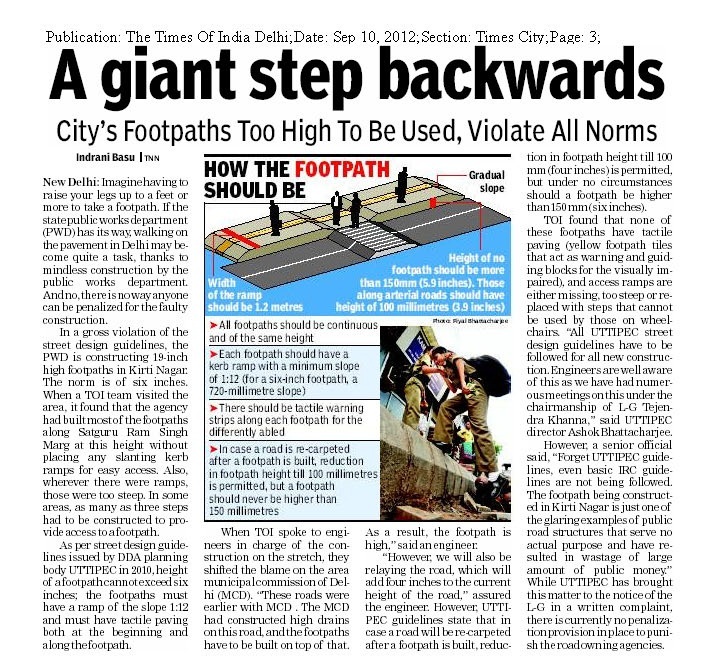 “By encouraging walking and cycling, we will be able to tackle congestion, bring down pollution, create open public spaces and deal with the problem of untreated sewage,” said an environment department official. New Delhi: DDA has been on a drain covering spree, but UTTIPEC says space utilization has been the worst. Instead, developing it aesthetically, treating the sewage and creating cycling and walking paths along the drains would be a much better approach. “Covering drains opens up some space and covers up an eyesore, but a better utilization would actually happen if the sewage was treated. Once the drain is covered up, the civic agencies are likely to forget about the problem. Also, sewage undergoes natural treatment through sunlight and aeration in an open drain. Once it is covered, the chances of it raising a stink actually go up,” said UTTIPEC director Ashok Bhattacharjee. 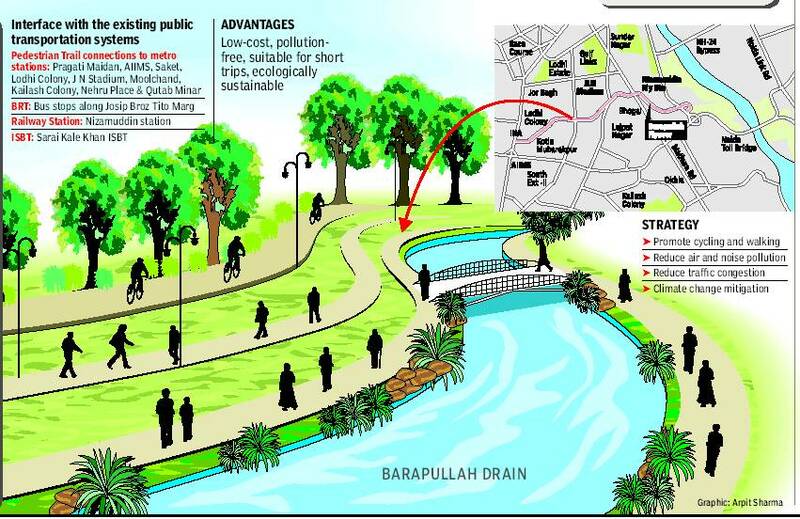 UTTIPEC's Non-Motorized Transportation Eco Corridor plan says, “Concrete slab effectively stops groundwater recharge and the slab cover over the nullah shall aggravate the ‘heat island’ effect.” Water has a natural cooling effect on its surroundings: an advantage that will be lost during Delhi's searing summer. The project also says desilting the drains once they are covered would become an expensive and cumbersome task. Such cleaning, it says, will “require super suction machines” since cranes etc would no longer be able to access the sewage. “The sewage shall be deprived of sunlight and oxygen, creating septic conditions, increase the river's pollution load,” it adds. Officials suggest the sewage should be treated and the channel reused as a parkway. 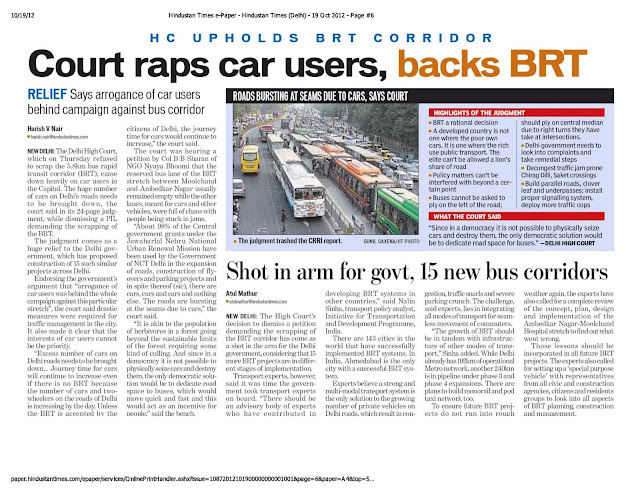 “Instead of making everything into a concrete jungle, the area could be developed as a green belt and a linking route for NMT users from one public transport point to another,” said a source. The Defence Colony drain, on which work is still on, has left residents quite unhappy. “Since work on covering the drain has started, sewage has started backflowing in our bathrooms. The stench has also increased,” said AP Singh, a resident. The sewage being carried by the drain shall be deprived of sunlight and oxygen, creating septic conditions and effectively increase the pollution load on the river. To Move more People in Less Vehicles - Car is the most inefficient mode for this. Train is the most efficient and Buses are the next cheapest, most efficient and most widely available mode of pubic transport. "Depending on vehicle size, occupancy or loading and speed, the use of space can vary greatly for different modes of travel - potential passenger volumes vary greatly by mode along a corridor. The Car is the most spatially inefficient mode. Dense urban centres cannot effectively be served by cars, since not enough people can be delivered to the centre."